Visa, one of the leading payment solutions providers, has rolled out its financial literacy programme for media in Pakistan by organizing the first educational workshop on financial literacy at the Karachi Press Club (KPC). 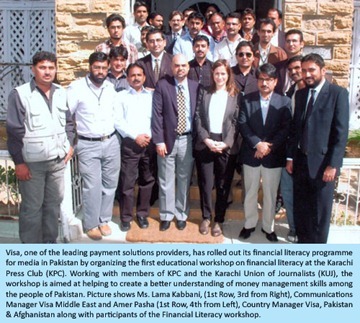 Working with members of KPC and the Karachi Union of Journalists (KUJ), the workshop is aimed at helping to create a better understanding of money management skills among the people of Pakistan. The workshop was conducted by Visa Corporate Communications Manager in the Middle East Ms. Lama Kabbani and Country Manager for Visa Pakistan and Afghanistan Mr. Amer Pasha. The workshop was attended by leading journalists from print and electronic media. “Visa believes the most important financial tool is not a product — it is knowledge. That is why, for more than a decade, Visa has been developing financial literacy programs that teach individuals how to spend, save and budget responsibly. “With more than five million Visa cardholders in the country, this was an ideal time to launch our financial literacy campaign in Pakistan, with the aim of raising awareness around the importance of financial management. As part of its Financial Literacy programme, Visa also has plans to launch a localized version of its dedicated financial literacy website, www.mymoneyskills.com to help people of all ages across Pakistan to strengthen their knowledge of personal finance. Providing fundamental personal finance information in both Urdu and English on topics such as learning how to plan a budget, preparing for the future, using a credit card wisely and spending responsibly, the website will form an engaging platform for all audiences including young people, families and schools to improve their financial literacy skills. In addition, Visa is also set to launch a university program in which a series of seminars will be organized in business schools by combining finance and fun to create further understanding of money management skills among young people in Pakistan.